CAPE CANAVERAL, Fla. -- The launch of NASA's space shuttle Endeavour tomorrow is expected to draw up an enormous crowd to Florida's Space Coast to catch what will be the fleet's next-to-last flight before the 30-year-old shuttle program retires for good. Even President Barack Obama and his family are attending the launch. NASA and Florida tourism officials expect a massive turnout of at least 700,000 spectators for Endeavour mission. The shuttle is set to blast off tomorrow (April 29) at 3:47 p.m. EDT (1947 GMT) from Launch Pad 39A here at Kennedy Space Center. It will be the 25th and final flight of Endeavour as NASA's shuttle program winds down. NASA mission managers have reminded workers to give themselves extra time for commuting to and from the Kennedy Space Center, since major traffic snarls are possible. Some launch officials said yesterday that they've even advised workers to pack some snacks along, in case the traffic is more severe than expected. Among the visitors to Cape Canaveral will be President Obama, his wife and two daughters – the first time ever a First Family will watch a launch together – as well as Arizona Congresswoman Gabrielle Giffords, wife of Endeavour's commander Mark Kelly. The details of President Obama's visit have not yet been finalized; it has not yet been decided where he and his family will view the liftoff. "We will be ready to accommodate wherever that location is and certainly we'll be happy to have him," Spaulding said. The weather forecast for Friday's liftoff has dipped slightly, with NASA downgrading the chances of clear conditions from 80 to 70 percent – still an encouraging outlook. "We have a 30 percent chance of KSC weather prohibiting launch," shuttle weather officer Kathy Winters said during a Thursday press conference. "The main concerns are crosswinds and [cloud] ceilings lingering in the area." After Endeavour's mission, NASA has only one more shuttle mission planned. 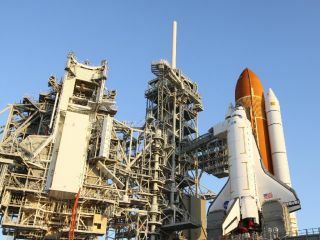 The shuttle Atlantis is slated to lift off June 28 for one last trip to the International Space Station.